The Yankees and the Dodgers have reached an agreement this morning in principal which would swap reliever Scott Proctor for infielder Wilson Betemit according to ESPN. The Bombers have been looking to upgrade their bullpen and feel like they have done so by abandoning a pitcher who has surrendered 4 homeruns in his last 6 outings. At one point at the end of June the hard throwing righty became so frustrated by his performance that he set some of his equipment ablaze on the top step of the Yankees’ dugout. Now he will have a fresh start with the same team that drafted him in the 5th round in the 1998 draft. In return the Yankees got Betemit who they failed to acquire at last years deadline when he was sent to LA from Atlanta. Betemit has played third-base, shortstop, second-base, and right field this season. He is hitting .231 but has a .359 OBP and does have power averaging a homer about every 15 at bats. He will challenge Andy Phillips for first base time, but Phillips is currently enjoying an 11-game hitting streak and has hit safely in 16 of his last 17 games. This means that while Betemit will get some at bats at first he could also see some time while Torre rests Arod, Jeter, and Cano. This also gives the Yankees the room to upgrade their bullpen from within. Joba Chamberlain has been switched to the pen for the Yanks Triple-A affiliate in anticipation of his promotion to the bigs. Hit threw an inning of relief last night and was impressive as he struck-out all three batters he faced. 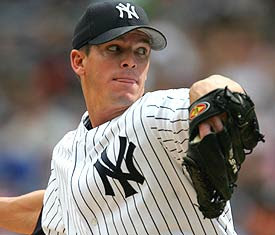 He is going to throw an inning of relief tomorrow then he might be seen in the Bronx. For more deadline updates go to Hot Stove NY.